Guide rails, clevis pins, housings, gears, bushings, plates, discs, shafts, sprockets, chains. Induction hardening, hardening, carburizing, annealing, quenching and tempering, solution annealing, normalization, tempering. 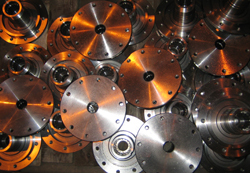 Structural steel, tool steel, stainless steel, cast steel, cast iron, bronze, brass. Mining machinery, rail vehicles, automotive industry, food industry, hydraulics.